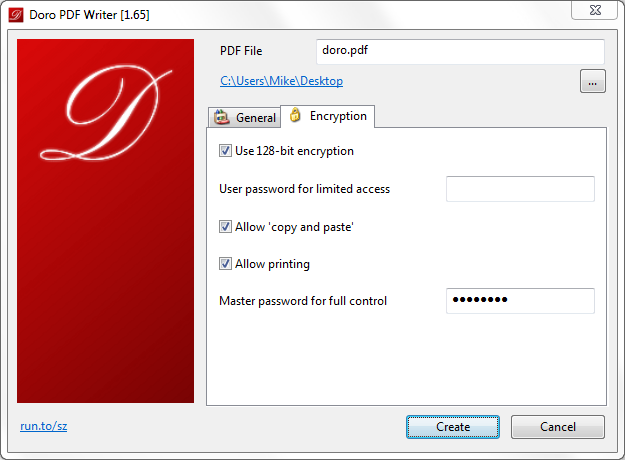 Doro PDF Writer is a simple tool which makes it easy to create PDF files from almost any application. As with many similar applications, the program works by installing a virtual printer driver. If you then want to create a PDF file of a web page, say, then simply open this in your browser, choose the Print option, and select the "Doro PDF Writer" printer. Opening the printer Preferences dialog reveals a few basic settings. This is where you'll configure the print resolution, for instance, which can be anything from 72 (poor quality but tiny files) to 4,000 dpi (extreme high quality to the point of overkill, and huge files too). Once you've chosen the print option, the core Doro dialog appears. This doesn't have the power of some of the better PDF creation tools; you can't control image compression or font embedding, for example. There are options to enter document metadata, apply password protection, and restrict printing or copy and paste of your file, though, and so will be perfectly adequate for many purposes. And notably, while we haven't tested this, the authors claim Doro PDF Writer is unusually compatible, running on every version of Windows from XP through to 10.